You know what to do when you have a few really ripe bananas! 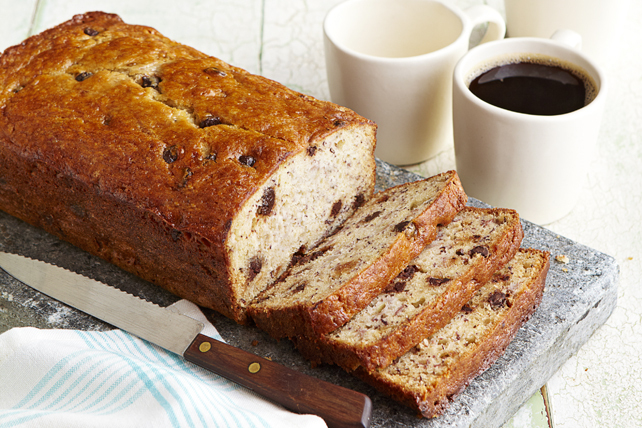 Whip up this moist, tender banana bread studded with chocolate chips. Combine flour, baking powder and baking soda. Beat butter and sugar in large bowl with mixer until blended. Add eggs and sour cream; mix well. Add bananas and flour mixture; mix just until moistened. Stir in chocolate chips. Pour into greased and floured 8x4-inch loaf pan. Prepare recipe as directed, using a greased and floured 9x5-inch loaf pan, and increasing the flour to 2-1/4 cups, and the sugar and sour cream to 1 cup each. If bananas have turned brown and are too ripe to eat out of hand, don't throw them away. Peel and mash them, stirring in 1 tsp. lemon juice for each banana. Freeze in an airtight container for up to 6 months. Thaw the banana purée in the refrigerator, then use to make banana bread, banana cake or muffins.